Customer satisfaction with the West Midlands Observatory is at its highest ever level according to a recent customer survey. Satisfaction with the Observatory has been rising year on year since 2006, and this year reached its highest ever score (3.19 on a scale of 1=low to 4=high). With current turbulence in local and regional governance, it is easy to lose sight of the role of evidence in overcoming the deep-seated problems and challenges faced by the West Midlands. We are encouraged by this endorsement of our work by our customers, and I urge partners to realise the increased importance of evidence based decision-making in a time of increased budgetary pressure. The Observatory will continue to provide authoritative and high quality research to help decision makers target limited resources and do more with less. Other highlights of the survey included the highest ever ratings for the awareness and reputation of the Observatory. And over 93% of users said they regard the Observatory’s research to be independent and objective. The high customer rating follows on from the Observatory being recognised as an “Excellent” organisation by independent assessors Investors in Excellence earlier in the year. We are in desperate need of hard facts and a cool assessment of what the facts tell us. It is too tempting to manage by anecdote and the Observatory helps stop this. In a world of Local Enterprise Partnerships, we still need the Observatory output. Of these 88 successes, Advantage West Midlands were involved with just under half but this assistance helped create over 60% of the new jobs. Some of these inward investments were high-profile including Kraft’s acquisition of Cadbury in Bournville, Birmingham affecting nearly 3,000 employees at their head office as well many more around the country. Other investments in the news included the acquisition of Birmingham City Football Club by Far Eastern businessman Carson Yeung’s Grandtop International, the continued expansion of the ex-Longbridge car plant by SAIC of China where a new engine test facility is to be built and the taking on 50 skilled engineers by Indian Tata Group’s Jaguar Land Rover. Two other investments from the United States also catch the eye. Remotec in Coventry, a subsidiary of Northrup Grumman, expanded its facility designing and manufacturing robotic bomb disposal units. But it’s the opening of a new computer games design studio in Digbeth, Birmingham by Microsoft-owned Rare Games that’s hoped will give a boost to games design in the Midlands. 90 new games designers will be employed there. 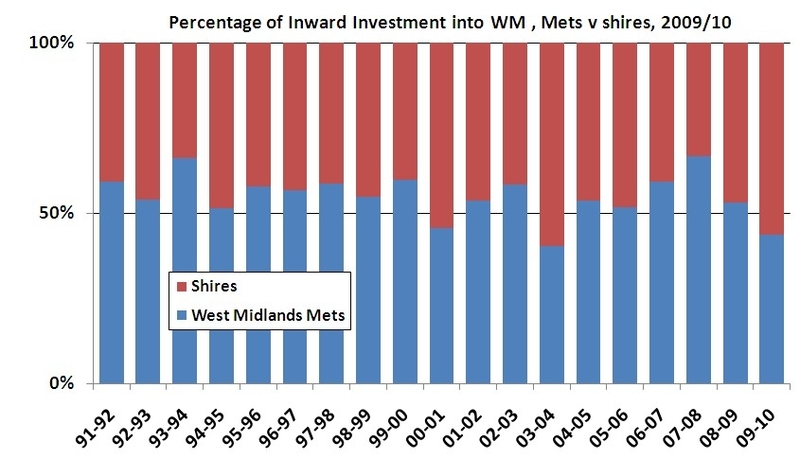 Further analysis of the inward investment figures show that, with 88 investments, 2009/10 saw the fewest number of investments in the West Midlands since 2005/06 when investment numbers were still recovering from the falls in global investment since 2001. This highlights the fact that the global economic crisis began to seriously affect investment decisions.